I told you guys I'd let you know how it went hiking up to Colchuck Lake. Well, we made it, but it cost us. That's right, the picture you see above is one I took! As far as how I'm feeling after that hike that happened three days ago? Let's just say I'm still really sore! It was easily the coolest hike we've ever done, but it was brutal! Usually when you do an out and back hike the way back is much easier. Most of it is downhill and it goes by so much faster than the climb up did. While we did get back down the mountain faster than we got up it, it felt a whole lot longer and more grueling. When you're walking back down from Colchuck Lake you're not just on some trail, you're climbing down creeks, over boulders, around tree roots, and pretty much making sure every single step is not one that will make you trip. I'm not kidding. Check out the photo I took of the "trail" below. It was really cool, but the terrain really took it out of us. We were all beyond done when we still had about two and a half miles to go. There were some tears and the kids weren't the only ones complaining that their feet hurt and they wished we were back to the car. It's the first hike marked as HARD we've ever done. Before we've stuck to easy or moderate hikes. It was a little too much for us, but we did it and for that I'm really proud of us. Our kids are 6, 7, 8, & 9, so this was one hike were we didn't see many other children and when we did they were usually older. The kids have recovered a lot faster than my wife and I have though. It didn't help that my wife's knee has been bugging her and that I had a double header of two softball games on Sunday in 98 degree heat. That was the day after the hike and it just about killed me. I'm doing a bit better today, but I'd say I'm still maybe at about 60% back to feeling normal. I am exhausted. It sure was an adventure though! I love my family. My wife got us into hiking and we love it! It started when my kids complained while walking 2 blocks to the corner store to get a treat. She was mortified that they couldn't walk two blocks so she decided we would start hiking. At first we just did a mile or two and they got better and better. We found that they would complain on a walk around our block but when they were out in the woods on trails they were too busy having fun and being distracted with the beauty all around us to complain much. We now try and hike at least once or twice a week. The longest trail we've ever hiked now is 8.6 miles. This weekend we are going to do the Colchuck Lake Trail. If you follow that link you'll see it's rated as HARD. We usually stick to moderate trails. This hike is probably going to kick our butts and take us like 10 hours but we're going to do it. I'm going to try and get myself to jump in the alpine lake even though there may be snow on the mountains around me and it's going to be frigid! It's sure to be an adventure! Wish us luck and I'll let you know how it goes in a few days when we're back to civilization and I'm done with church music and softball games on Sunday. Thanks for stopping by! I revised chapter 11 of 50 a few days ago and that's the last time I made progress on it. It was a really busy weekend filled with hiking, playing guitar and singing for 2nd - 6th graders at church on Sunday morning, and a fun Father's Day lunch at the lake. My wife took that sweet photo below. She helped me get the kids up some huge rocks. The view from the top was awesome! It was a fun hike. I really need to get cracking on my revision though so I can pass my book off to beta readers and get feedback on it. That will be really exciting. Handing your story off to people for the first time is always a little nerve racking, but I'm excited about it! You'll never get better if you don't let other people read your stories and learn what they liked or didn't like. Hopefully I'll be reporting back soon that I've revised a ton more chapters and I'm close to finishing the revision. If all goes well this will be the first full length novel I've written that I will publish. It will be the first novel that I won't have to go back and hack into a whole bunch to fix. Thanks to my outlining process I think the story works well and will not need huge story edits. That's my hope anyway. If people like it and don't have feedback about the story not working I think "Haunted House Flipper" will be my first full length novel that I'll publish. It's been a long road getting here with 3 other novels written that I'll probably never publish without a full rewrite. With that said - getting my first novel published is really the beginning of this long writing journey I'm on. Once I have 5 to 10 of them published, then I think I'll finally be on my way. I'm still driving toward the freeway hoping I didn't forget to pack anything. I did all I could to prepare though, and I'm ready to start my trip. Let's do this! Okay, I think I ran that metaphor into the ground :) Thanks for stopping by! In this 65th episode, I review The Heart Thief by S. Lee Benedict. Listen to hear why I thought this book was a fantastic combo of supernatural thriller meets coming of age meets police procedural. It was so good for so many reasons and the second book in the series is out now to so check this one out! Support the show AND get a free audiobook! 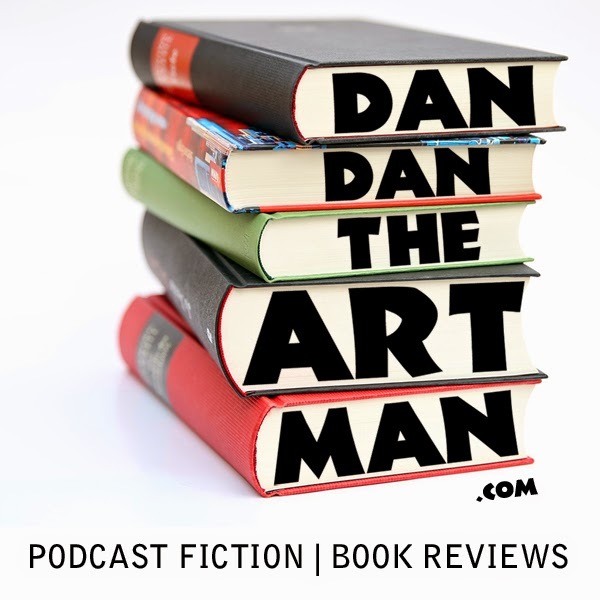 This episode of Dan Dan The Art Man's Book Reviews has been brought to you by Audible. Visit www.AudiblePodcast.com/DansBookReviews for a free trial membership. I've been using the bulk of my writing time to read through the manuscript of a friend's first novel. I'm happy to say that I'm really liking it so far and it's been a pleasure to read. It's a long book and I'm glad there's a lot more story to go. I'm over a third of the way through it and I've only found like four typos! He writes clean stuff and/or did a great job editing it before handing it off to me. I'm not giving you his name or the name of the book, but I'll be sure to let you know about it when he gets it published. The first draft of this novel is done and I'm about 25% of the way through revising it. Once that's done I'll give it to Beta Readers, make some more revisions with their feedback, and publish it! I'm in chapter 15 of 24 so the first draft of this book is well on its way to completion. Then I'll revise that bad boy and get it in the hands of Beta Readers. Hopefully I can publish it this year as well. The first draft of this book is done! I'm still working on the illustrations for it though, and waiting to get feedback on it from a classroom of 4th graders who had it read to them in class by their teacher who plays on my softball team :) I'm hoping to get this book published this year as well. I need to get those illustrations finished! That's about it, although I did write a really fun short story for an anthology about an elephant sized man eating bear. The Anthology is tentatively titled Mythos. I'll let you know more when it's available. Thanks for stopping by! In this 64th episode, I review The Giver by Lois Lowry. Listen to hear why I thought this book was one of the most interesting books I've ever read. The changing story world pulls you in as you discover things are not what they seem.